Signing off and toasting: To having regular consistent articles for your health blog. Originally published Sept 2017. Updated with even more awesomeness January 2019. If you have a health & wellness website, one of the main ways to get found online and build your KLT (know, like, & trust) factor with your audience is with your blog. Today, I’m sharing my process and some awesome shortcuts you can use on how to write an article for your health blog. 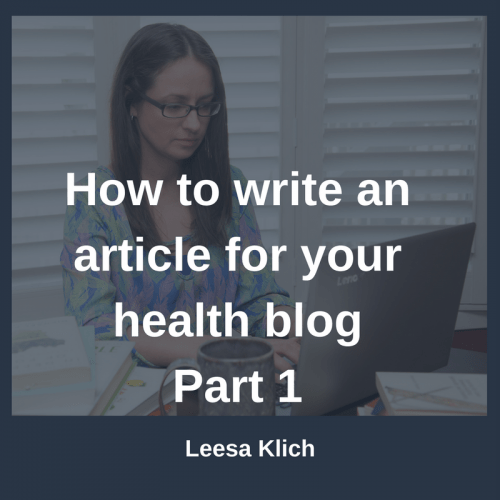 This is part 1 and includes the first steps to take if your struggle is quantity of health content – how to actually put together a blog post. Part 2 is all about health content quality, for those few epic cornerstone “pillar” articles you will need. To take a mini-quiz to see where you can start ramping up your health blog, click here. Getting clear on your vision, mission, and niche will give you a direction for your blog that guides everything you publish. You need to know who you’re trying to attract and how you’re going to impress them. Your approach to writing articles for your health blog will differ based on how much time you have to do it. There are lots of places to get blog posts without writing each one from scratch every week. If you have 2-8+ hours per week, you can create some pretty freaking awesome content on your own. Free supplement resource from you to your clients (8 expert tips). Edit and brand it as you like. You can upload it to your site as is. Feel free to customize it however you want to (I reference some Canadian laws in it, so you can remove those if you’re not in Canada). You can even publish some of it on your blog while saving the rest to be a free download to build your email list. NOTE: Personally, since I’m a professional writer, I consistently blog every week. I research and write health articles for a living. I focus on long-form posts and spend a lot of time on each post. For example, this post has taken me almost 6 hours. And my 2,000+ word scientifically-researched “done for you” health articles for sale here, take me 12+ hours each. (Yep, I actually squint at my screen for hours to *read and decipher* that language I like to call “science-ese!”) This is by NO means an expectation or industry standard, it’s just to show you that I choose to dedicate many hours per week researching and writing, but you don’t have to. If you have at least 10 minutes to make a bit more of a strategic decision on your topic, then head to this post that outlines what should be your top 5 priorities when choosing a topic for your next blog post. If you have a few minutes to choose a topic, but not enough to create an article from scratch, then have a look at the “done for you” health articles I sell here. After you buy them, read them over and customize them to suit your brand, tone, style and angle. Add a story, client example, recipe or even some swear words if you like (I promise I don’t add any f*bombs in these — they’re definitely rated PG). Then go ahead and publish them your blog as though you wrote it yourself. 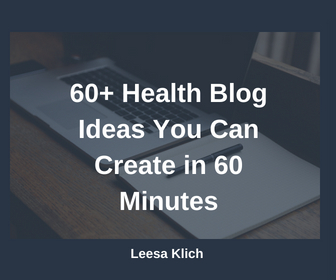 If you have an hour you can use one of these 60 health and wellness blog topic ideas. These aren’t headlines, but actual ideas that you can use to generate multiple headlines from. You can pick one and create something short and sweet (or long if you have the time). You can even record an audio or video instead of writing out a blog post. You should totally check out the timeline I included to get it done in 60 minutes. Download this checklist for the next time you need a post fast. If you haven’t bought a researched done-for-you article and you’re writing one yourself, I highly recommend doing research to add credibility and trust, AND stand out in the massive wellness market of people selling random unproven (sometimes illegal) shiz with BS albeit rather “sciency” sounding health claims. The vast majority of health and wellness bloggers are putting out crappy, short, un-researched health content on the internet, so a bit of good quality research goes a loooong way! Not only that, but doing your research allows you to take a bold stand on hot health & wellness topics. It gives you the confidence to jump into controversial conversations because you have backup citations. In case you haven’t noticed, I’m a total research nerd (even if I didn’t wear glasses 🤓) and I love learning about health topics. If I haven’t yet convinced you, here are 3 solid reasons why you should do your research, especially for health blogs. But please, please DON’T TRY TO FIND RESEARCH TO PROVE YOUR POSITION! It really works the other way around – DO RESEARCH TO FORM (OR UPDATE) YOUR POSITION. NOTE: I have no shame in admitting that I was totally convinced of a “fact” based on decades-old preliminary research and I promptly updated my position with the newer and better information. Read here about the time that one study completely changed my mind about gut microbes. I also understand that not everyone loves digging into data and translating “science-ese” into English as much as I do. (It’s an ~acquired~ taste.) This is why I created the post “How to research health topics EFFICIENTLY.” You don’t need to spend hours and hours finding information (unless you want to…like I do). The purpose of creating an outline for your health article is to save time and have a clear focus. The skeptic in me loves to just let the research lead the way. I found that it actually works. If I just start writing as I’m going through my references one at a time, my posts take me hours longer than when I’ve done a preliminary review of the references and outline my article. By starting with research, the outline of your health article becomes pretty simple – pull out the points you want to share with your audience and make each one of those a subheading. I do this by quickly skimming through the study abstracts. I often do this right in WordPress (frequently saving it as a draft). Feel free to use MS Word, a Google Doc, or even a paper & pen. However you like to create your outlines is great. The outline can evolve as you’re writing, but having it as a backbone is helpful when you don’t have a ton of time. Once you have an outline, definitely start drafting your post online, not on paper. This is when I start reading the research I’ve collected (not just glossing over the abstracts like I did for the outline). As I go through each study (often reading out loud as I’m squinting at my screen and repeating run-on sentences over and over until the people around me feel like they’re trapped in an echo chamber with multi-syllabic words that kinda maybe seem like they *might* be English – or Latin – and I really start to understand the scientific concepts) I pull out excerpts and points that relate to each subheading in my outline. The objective at this stage is to create a rough draft of your article. Not to edit. Just to put concepts down on the screen. Save the critique of your spelling and grammar, and try to get some text down under each subheading and add more subheadings if you come across something you missed when skimming through your references. Don’t worry too much about your introduction and conclusion – focus on the body of the article first. This step is finished once you have a draft of the whole health article. PRO TIP: Sometimes my draft starts taking a long time or is very long. This is when I decide to break a post up into two posts (e.g. part 1 & part 2 is next week). After you have the first draft, now you can finally read through it with a critical eye. Look out for spelling, grammar, and punctuation. Check if the information has a logical and smooth flow. And “nit-pick” it to see if you used consistent terminology throughout (e.g. “done for you” vs done-for-you, etc.). Now is the time to create (or review) the introduction and conclusion. Then brainstorm headline/title ideas. How can you capture the essence of the article in an interesting sentence? They’re your first shot at getting readers. The headline can make or break the traffic on your article. If you need some help, I compiled links to a few resources to help you with your health article headlines here. PRO TIP: If you’re SEO-optimizing your post because you did keyword research (which I cover in part 2 of this post), then you want to make sure that your keyword is in your headline and introduction. Now look to see if each subheading has about the same amount of text. Is your header formatted to be H1 and sub-headings H2? Is the post a good length? Do you have at least one good image for the post? If you want tips on finding and using images for your health blog, here’s some image advice. Have your social media headlines/images set (if you use a plugin for that). At this point, I’d also check the SEO score, but I’ll talk about that in part 2. If possible, save the final check for the next morning. You will be able to easily find missed details with a fresh mind. Now, hit that “Publish” button so it’s live on the internet. …But it doesn’t end there! Don’t forget that your brilliant new post is not going to go far if you don’t promote it! If you don’t promote it, they will NOT come! Link to it across social media. If it’s evergreen content, schedule it to be shared again (and again) in the future. Add the intro and link to the post in your email newsletter. Post the link in FB groups on “promo” days. Create a full promotion strategy for your awesome new post! Get the word out that you have valuable expertise that the world needs to know about. This is the first part in a blog series based on my How to ramp up my health blog quiz. It’s about getting over the first hurdle – QUANTITY. Having regular and consistent content for your blog is the best way to build your audience, demonstrate your expertise, and promote your offerings. When you have time to rock out something great: Do research, outlining, writing, editing, formatting, and publishing. It’s up to you. Consider the amount of time you want to dedicate to it, what your audience wants, and the way you are using your blog to build your KLT factor (know, like, trust). These strategies for improving the quantity of your blog posts are going to be OK for most of them. However, you will need at least a few epic (longer-form, more thoroughly researched, SEO-optimized) cornerstone articles (quality). This is what I talk about in part 2. What do you think? Do you struggle with time to create health articles? Do you consistently publish enough of them? Did I miss any other great tips and strategies that help you? Have you used any of these strategies? Are you going to try them? Awesome and very informative blog post. A lot of good tips that I can implement right away. Thank you for sharing. Love this, so many great tips here!